Dolgellau TownThis former slate town in the shadow of Cadair Idris has more listed buildings than any other town in Wales - more than 200 of them. Some of the most elegant date back to Dolgellau's time as a regional centre for the Welsh woollen industry. Historically, the town's most important industry was wool. However through the 18th and 19th centuries the town experienced a boom in the tanning industry that was followed by a gold rush. Today, Dolgellau's economy relies mainly on tourism although agriculture continues to play a significant role, and as such a local farmers' market is held in the town on the third Sunday of every month, and each Friday, the town holds a 'diwrnod sêl' or sale day. The town's name has an uncertain origin. 'Dôl' is Welsh for 'meadow' and 'gelli' means 'grove' or 'spinney', and is found commonly in local names for farms and sheltered nooks. While this is the most likely meaning 'Meadow of Groves', another suggestion is that the name could derive from the word 'cell' meaning 'cell', making the translation 'Meadow of Cells' which might relate to the monks cells at Cymer Abbey. 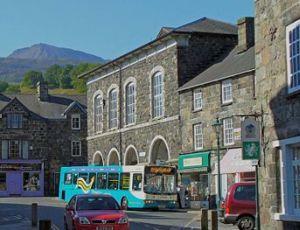 Today, Dolgellau welcomes many thousands of visitors annually. Many who come from across the Atlantic to trace their ancestry, others to walk and enjoy the stunning scenery and taste the local culture. It is a haven for walkers and climbers who enjoy the challenges of the nearby mountain ranges including the famous Cadair Idris - the giant Idris' chair. 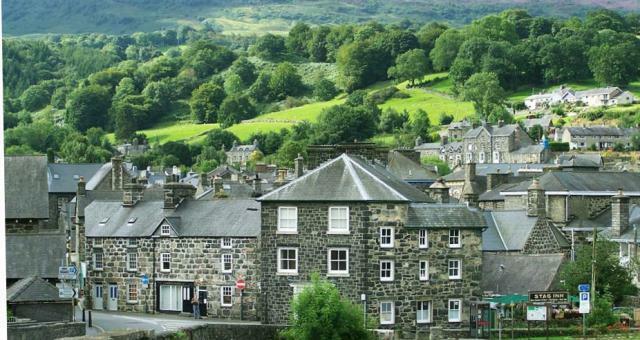 Dolgellau stands in the centre of what was once the Celtic tribal lands of the Ordovices, who were conquered by the Romans in AS 77-78. While it does not seem as though a Roman fortress was located at the site of today's town - the area would have been marshy during the period - a few Roman coins from the reigns of the Emperors Hadrian and Trajan have been found in the vicinity, and three hill forts around Dolgellau remain of uncertain origin. Following the withdrawal of Roman Forces from Britain, the Dolgellau area came under the control of a series of Welsh chieftains. It would seem that the story of Dolgellau as a town begins sometime around the late 11th or early 12th century when a settlement was established as a 'serf village' or maerdref, possibly by Cadwgan ap Bleddyn. It seems to have remained as such, as it is mentioned in these terms in annals during the reign of Henry Tudor (1485-1509). While Cymer Abbey in nearby Llanelltyd, founded in 1198, was the most important religious centre locally, during the 12th century a church was built for the inhabitants of the maerdref. This building was later demolished and replaced by the current church built in 1716. It seems that from the mid 12th Century, Dolgellau gained in importance, and as such was mentioned in the Survey of Meirioneth ordered by Edward I. Later in 1404, during Owain Glyndwr's national uprising, Dolgellau became the location of a council of chiefs led by Glyndwr himself. Perhaps the most infamous sons of the region were the Red Bandits of Mawddwy - Gwylliaid Cochion Mawddwy. These were a band of robbers from the Mawddwy region to the south of Dolgellau, who were active during the 16th Century and are remembered in the folk literature of the area, as well as in a number of place names such as Llety's Gwylliaid (bandits lodging) and Llety'r Lladron (robbers lodging) near Bwlch Oerddrws. The pub in Mallwyd is also named Brigands Inn. Another feature which has attracted attention to this region south of Dolgellau is a field known as Camlan, near Dinas Mawddwy. It has been claimed as the site of the last battle of King Arthur, based on a mention of the name in the Annales Cambriae to the Battle of Camlann. This former slate town in the shadow of Cadair Idris has more listed buildings than any other town in Wales - more than 200 of them. Some of the most elegant date back to Dolgellau's time as a regional centre for the Welsh woollen industry.